Yesterday I shared the news that Hermès are launching a limited collector’s edition bottle for Eau des Merveilles to celebrate its 10th anniversary. This got me thinking about the scent itself and the fact that I had never taken the time to sit down and review it in full – a truth that is absolutely criminal seeing as it is one of my all-time favourites. So today, rather than focusing on something ‘brand new’, I’d like to give a brief nod to a beautiful fragrance on its 10th birthday. Eau des Merveilles was created for Hermès by perfumers Nathalie Feisthauer (Gardénia Pétale and Putain des Palaces) and Ralf Schweiger (Fils de Dieu, The Afternoon of a Faun and Cédrat Enivrant) in 2004 as a topsy-turvy perfume that displays no top, middle and base notes, instead opting for an “unusual revolving structure” consisting of three accords; “The Spirit of Wood”, “The Memory of the Ocean” and “The Sparkle of a Constellation”. The result is something entirely unconventional, yet incredibly familiar, evoking the feel of a well-know melody caught on the breeze – recognisable, yes, but difficult to identify. Since its launch, Eau des Merveilles has been through the Hermès flanker-mill a number of times. To date, the family consists of; an Extrait version (Parfum des Merveilles), a richer and more gourmand interpretation (Elixir des Merveilles), a version that displays more transparency (Eau Claire des Merveilles) and even one flanker that is full of edible amber (L’Ambre des Merveilles). As with all things Hermès, these familial fragrances are all brilliantly executed, but it is the original that remains the most striking and even ten years down the line, Eau des Merveilles is still the star of the collection. 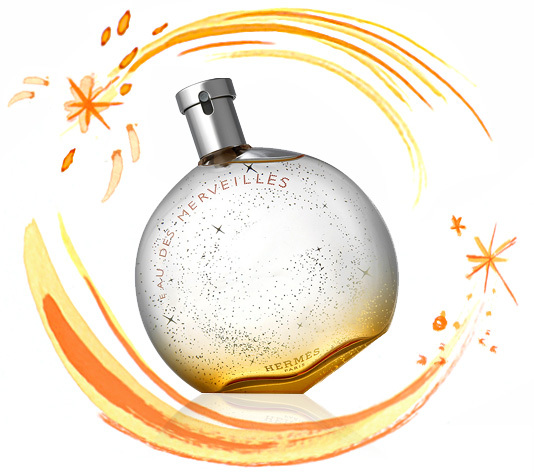 Eau des Merveilles opens with citrus and spice – a wave of orange, metallic elemi and pepper. There’s an immediate haziness and fuzziness to it that is intriguing in the sense that it is highly textured and because it plays incredibly well next to the sharpness of the unconventional feel of the citrus notes, counterbalancing their more sour tones and softening their sharp edges. This may sound like a blur, but in reality this lack of clarity creates a silky feel that sits very nicely on the skin. Underpinning the olfactory pyrotechnics of the spice and citrus in the top notes is a salty wood accord that, once again, feels pliable, dense and thickly textured. The imagined ambergris accord that sits at the core of Eau des Merveilles, feels intensely marine like and speaks of earthy barnacles, sun lotion-soaked skin and salty sea air mixed with the scent of driftwood caught in the surf. This all sounds discordant, odd even, but the truth is that this unconventional ode to the ocean is effortlessly wearable and luxuriously abstract in the very best way. Ultimately, Eau des Merveilles speaks of an old shipwreck, a trade ship that was packed with wooden crates of oranges and exotic spices, and has unwittingly spilled its cargo into the vastness of the ocean. This marine-like soup bobs along on the surface for eons, like ambergris, soaking up the scents of the sea and the sky, to create a salty paste of orange wood that is so smooth, it feels like a second skin. Eau des Merveilles is a beautiful perfume, it’s as simple as that. Hermès are masterful at creating universal perfumes – fragrances that can be worn at any time and in any place, smelling luxurious and dressed-up, and casual and unfussy, all at once. It would be fair to say that Eau des Merveilles fits into this category too, and whilst it smells utterly unique (other than its flankers, there really is nothing else that smells like it), its not demanding nor is it an attention-seeker, it simply creates a glistening aura around the wearer, shrouding them in a shimmering constellation of golden stars. Eau des Merveilles is available in 50ml (£69) and 100ml (£97) Eau de Toilette. A limited collector’s edition to celebrate the perfume’s 10th anniversary is available in 100ml for £97, as well as a Perfumed Body Cream (£68/200ml), Shower Gel (£42/200ml) and Body Lotion (£50/200ml). Sample, image, notes and quotes via Hermès. Video via bjorkdotcom on YouTube. Posted in Citrus, Hermés, Perfume Reviews, Unisex, Woody and tagged Björk, Citrus, Desired Constellation, Eau des Merveilles, Hermés, Marine, Nathalie Feisthauer, Perfume Review, Ralf Schweiger, Woody. Bookmark the permalink. Lovely! Glad to see this, as I think EdV is a new classic. It sure is! It’s great to see so much love for it. I adore Eau de Merveilles and it’s actually my SOTD today. It also clings marvelously to clothing. At an event with Ralf Schwieger, he mentioned that when they were testing it, they would spray it on fur to see what its clinging power was. Can’t you see it? Doesn’t that sound wonderful? That’s really interesting! It sounds fab. I can just imagine it on fur. Ooh, I got my sample out and gave it a spin, prompted by your coruscating review – it is going on silky smooth as you say, with a lovely seaside vibe to it. Very easy to wear and a bit dreamy. Definitely easy to wear and dreamy. It’s a marine scent with brains. This sounds divine, I’m going to have to go sample hunting.